Money is an ugly and uncomfortable novel like no other I’ve ever read.Â By the end of the book, I felt as though the room was crawling with cockroaches.Â The main character, John Self, is something of a cockroach himself:Â an unpleasant, abusive, fat, belching vulgarity with money.Â He is a man who has swallowed pop civilization whole:Â he is the result of too much consumption, too much eating, too little education and too much money.Â This book is his first-person account of what becomes an aborted attempt to make money – lots and lots of money.Â Self is not a very introspective character; nonetheless, even he can see that his world is rife with the casualties of money. 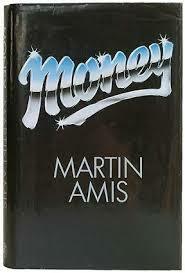 Â Â Money is depicted purely a corrupting influence.Â There are no “good” characters in this novel. Amis enjoys play with language, and he’s quite skillful at it.Â He invents very funny names for things and people.Â I liked his heartburn-inducing fast food concoction, the Blastfurter. On the whole, although I’m aware that the book is a technical and artistic achievement, I’m not certain that I liked it. Do I really need Martin Amis to provide another illustration of society’s ugliness?Â Of course not.Â All I have to do is read the news, which will inevitably be chock-full of anecdotes about the filth of living:Â corruption, greed, envy and abuse.Â The antidote to Money is Life of Pi:Â a beautiful book, a book that produces insipirations.